With The Town of Tonawanda, author John Percy has created an unprecedented collection of historic photographs, illustrating over a century of change. Readers catch glimpses of the town as it progressed from its agricultural era through industrialization, into suburbanization. Located immediately north of the City of Buffalo, the Town of Tonawanda was able to build on the success of that city’s nineteenth-century growth. 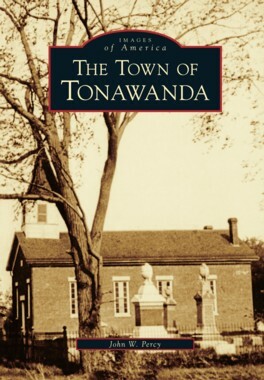 Luckily, the town’s development has been recorded on film; many rare and never-before-published photographs are in the collection of the Tonawanda-Kenmore Historical Society, the principal source for this book. Many of Tonawanda’s people made significant contributions to the growth of our nation, particularly in the development of technology. Features of town history are recognized worldwide, like the Erie Canal, the Niagara River, and our aircraft and automotive industries. Organized to illustrate the principal eras during the past century, over two hundred photographs depict the lumber industry, the canal, and the railroads that transformed the village of Tonawanda into a boom town. When the village became a separate city in 1903, the rural town developed a great industrial riverfront and the area’s first successful suburb, Kenmore. World War II brought even further growth of industry, population,and culture. As we shift gears into the twenty-first century, it is natural to reflect on our area’s lively past. This important new volume helps inspire the sharing of memories and stories between young and old, resident and visitor alike.